Sadeghi, F., Ahmadi, A. (2018). Detection of lung cancer using CT images based on novel PSO clustering. 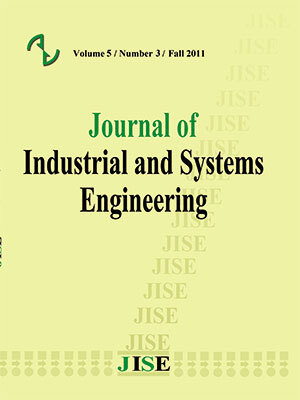 Journal of Industrial and Systems Engineering, 11(Special issue: 14th International Industrial Engineering Conference), 163-175. Fatemeh Sadeghi; abbas Ahmadi. "Detection of lung cancer using CT images based on novel PSO clustering". Journal of Industrial and Systems Engineering, 11, Special issue: 14th International Industrial Engineering Conference, 2018, 163-175. Sadeghi, F., Ahmadi, A. (2018). 'Detection of lung cancer using CT images based on novel PSO clustering', Journal of Industrial and Systems Engineering, 11(Special issue: 14th International Industrial Engineering Conference), pp. 163-175. Sadeghi, F., Ahmadi, A. Detection of lung cancer using CT images based on novel PSO clustering. Journal of Industrial and Systems Engineering, 2018; 11(Special issue: 14th International Industrial Engineering Conference): 163-175. Lung cancer is one of the most dangerous diseases that cause a large number of deaths. Early detection and analysis can be very helpful for successful treatment. Image segmentation plays a key role in the early detection and diagnosis of lung cancer. K-means algorithm and classic PSO clustering are the most common methods for segmentation that have poor outputs. In this article, we propose a new that of K-means and classic PSO clustering. The obtained results show that the new PSO clustering has better results as compared to the other methods. Comparison between the proposed method and classic PSO, in terms of fitness function and convergence of fitness function indicate that the proposed method is more effective in detecting lung cancer. Ahmadi, A., Karray, F., & Kamel, M. S. (2010). Flocking based approach for data clustering. Natural computing, 9(3), 767-791. Afshar, P., Ahmadi, A., & Zarandi, M. F. (2016, July). Lung tumor area recognition in CT images based on Gustafson-Kessel clustering. In Fuzzy Systems (FUZZ-IEEE), 2016 IEEE International Conference on (pp. 2302-2308). IEEE. Akgul, Y. S., & Kambhamettu, C. (2003). A coarse-to-fine deformable contour optimization framework. IEEE Transactions on Pattern Analysis and Machine Intelligence, 25(2), 174-186. Cui, X., Gao, J., & Potok, T. E. (2006). A flocking based algorithm for document clustering analysis. Journal of systems architecture, 52(8-9), 505-515. Cui, X., Potok, T. E., & Palathingal, P. (2005, June). Document clustering using particle swarm optimization. In Swarm Intelligence Symposium, 2005. SIS 2005. Proceedings 2005 IEEE (pp. 185-191). IEEE. Eberhart, R. C., Shi, Y., & Kennedy, J. (2001). Swarm Intelligence (Morgan Kaufmann series in evolutionary computation). Morgan Kaufmann Publishers. Davies, E. R. (1997). Laws’ texture energy in TEXTURE. Machine vision: theory, algorithms, practicalities. Grove, O., Berglund, A. E., Schabath, M. B., Aerts, H. J., Dekker, A., Wang, H., ... & Eikman, E. (2015). Quantitative computed tomographic descriptors associate tumor shape complexity and intratumor heterogeneity with prognosis in lung adenocarcinoma. PloS one, 10(3), e0118261. Holden, N., & Freitas, A. A. (2005, June). A hybrid particle swarm/ant colony algorithm for the classification of hierarchical biological data. In Swarm Intelligence Symposium, 2005. SIS 2005. Proceedings 2005 IEEE (pp. 100-107). IEEE. Jacob, M., Blu, T., & Unser, M. (2004). Efficient energies and algorithms for parametric snakes. IEEE transactions on image processing, 13(9), 1231-1244. Jain, A. K. (2010). Data clustering: 50 years beyond K-means. Pattern recognition letters, 31(8), 651-666. Juang, L. H., & Wu, M. N. (2010). MRI brain lesion image detection based on color-converted K-means clustering segmentation. Measurement, 43(7), 941-949. Nithila, E. E., & Kumar, S. S. (2017). Automatic detection of solitary pulmonary nodules using swarm intelligence optimized neural networks on CT images. Engineering science and technology, an international journal, 20(3), 1192-1202. Omran, M., Engelbrecht, A. P., & Salman, A. (2005). Particle swarm optimization method for image clustering. International Journal of Pattern Recognition and Artificial Intelligence, 19(03), 297-321. Shi, Y., & Eberhart, R. (1998, May). A modified particle swarm optimizer. In Evolutionary Computation Proceedings, 1998. IEEE World Congress on Computational Intelligence., The 1998 IEEE International Conference on (pp. 69-73). IEEE. Sonka, M., Hlavac, V., & Boyle, R. (2014). Image processing, analysis, and machine vision. Cengage Learning. Vafaie, H., & De Jong, K. (1992, November). Genetic algorithms as a tool for feature selection in machine learning. In Tools with Artificial Intelligence, 1992. TAI'92, Proceedings., Fourth International Conference on (pp. 200-203). IEEE. Xiao, X., Dow, E. R., Eberhart, R., Ben Miled, Z., & Oppelt, R. J. (2004). A hybrid self‐organizing maps and particle swarm optimization approach. Concurrency and computation: practice and experience, 16(9), 895-915. Xiao, X., Dow, E. R., Eberhart, R., Miled, Z. B., & Oppelt, R. J. (2003, April). Gene clustering using self-organizing maps and particle swarm optimization. In Parallel and Distributed Processing Symposium, 2003. Proceedings. International (pp. 10-pp). IEEE. Wu, M. N., Lin, C. C., & Chang, C. C. (2007, November). Brain tumor detection using color-based k-means clustering segmentation. In iih-msp (pp. 245-250). IEEE.